Choice thanks you for your interest in helping parents experience the happiness of having children. 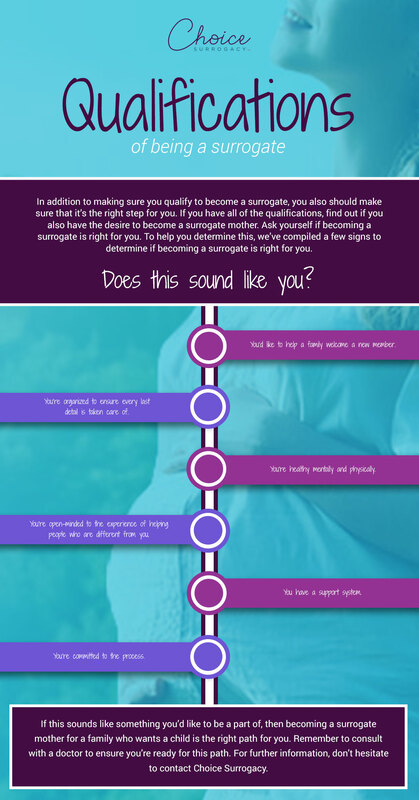 Below is a list of a few key surrogate mother requirements for women interested in learning how to become a surrogate for Choice Surrogacy. Have had a positive and enjoyable pregnancy! Be a female of 21-38 years of age. Have delivered one or more children. Have had past pregnancies with minimum complications. Completion of a series of medication injections assisting in the successful conception of an embryo implantation through In Vitro Fertilization. Be a non-smoker, living in a non-smoking home. Reliable transportation to and from appointments. Have no history of arrests or substance abuse. Choice surrogates must be committed to living a healthy lifestyle for themselves, as a surrogate and for the newborns. Having one mission in mind, to have a happy healthy successful journey in achieving pregnancy. First, submit the short intake form and upon approval, you will be prompted to complete a Choice surrogate application. Our staff will provide an in-depth discussion about your surrogate benefits in your first interview and education conversation.